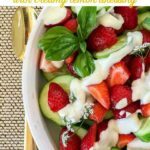 This Strawberry Cucumber Salad with Creamy Lemon Dressing is a salad with a surprise! A pinch of cardamom heightens the natural sweetness of strawberries and raises it to gourmet status! 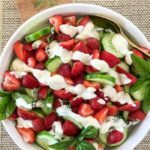 If you’re looking for a salad that’s just a little different, you’ll love this Strawberry Cucumber Salad with Creamy Lemon Dressing. It’s crisp and refreshing, but it has a surprise element that you don’t expect when you first see it. A pinch of ground cardamom heightens the flavour of strawberries and enhances their natural sweetness even more. What is cardamom and what does it taste like? Cardamom is a spice used in cuisines all over the world. It is slightly spicy, a little nutty, very aromatic and unique. It is sold either ground or in its original pods. 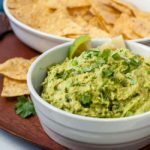 Both types will work perfectly in this recipe, but if you want the most intense flavour, buy the pods, open them up and grind the tiny seeds inside. Go easy. Too much cardamom will overpower your strawberries. Remember–you can always add more, but you can’t take it away! 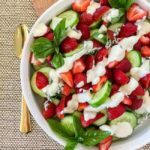 This strawberry salad spells summertime to me! Salads with berries like this Triple Berry Mixed Green Salad have so much flavour, colour and interesting texture! I used all ingredients from my garden: strawberries, cucumber, basil and I tossed a few edible flowers on top, just for fun. 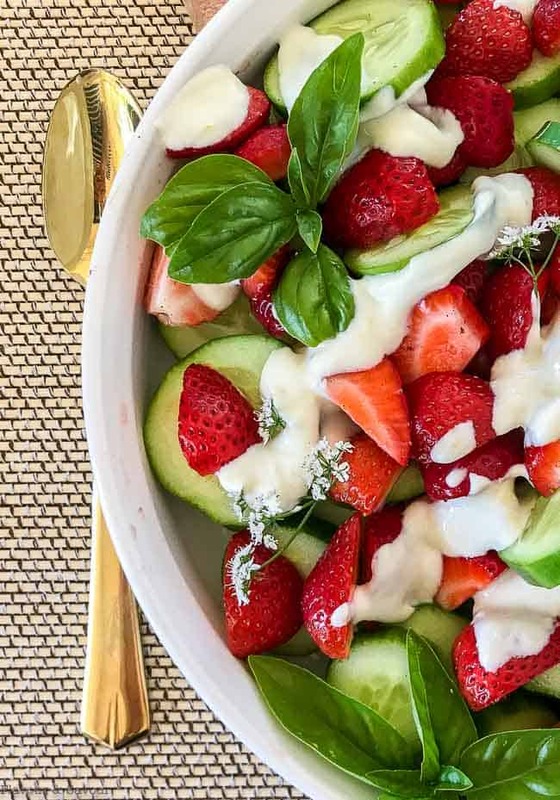 This Strawberry Cucumber Salad with Creamy Lemon Dressing is perfect for spring and summer. or any casual summer meal! 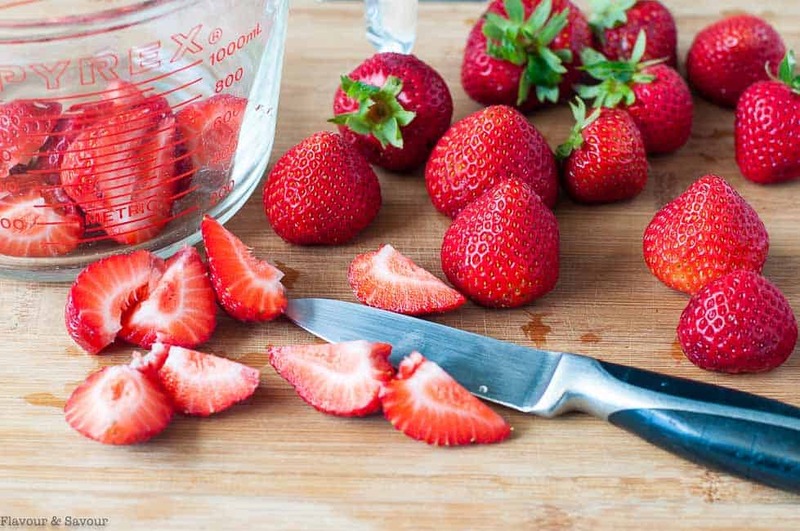 Head to your farmer’s market to pick up some fresh strawberries. Hull and quarter them, toss with sweetener and cardamom and set aside while you slice the cucumbers, toast a few almond slices and whisk the dressing ingredients. The Creamy Lemon Dressing is so simple to make. Whisk together some Greek yogurt with a little sweetener and some lemon zest and thin with a spoonful of cream or milk to make it pourable if the Greek yogurt is very thick. So easy but so tasty! Don’t forget to add the toasted almonds on top! They’re made much more interesting by adding a sprinkle of cayenne pepper and a pinch of salt. 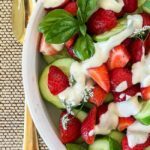 Can I make this Strawberry Cucumber Salad ahead of time? You can certainly prepare all the components ahead of time. Cucumbers have a way of turning watery when they sit for a while, so to avoid this I suggest doing what I did for a recent potluck. 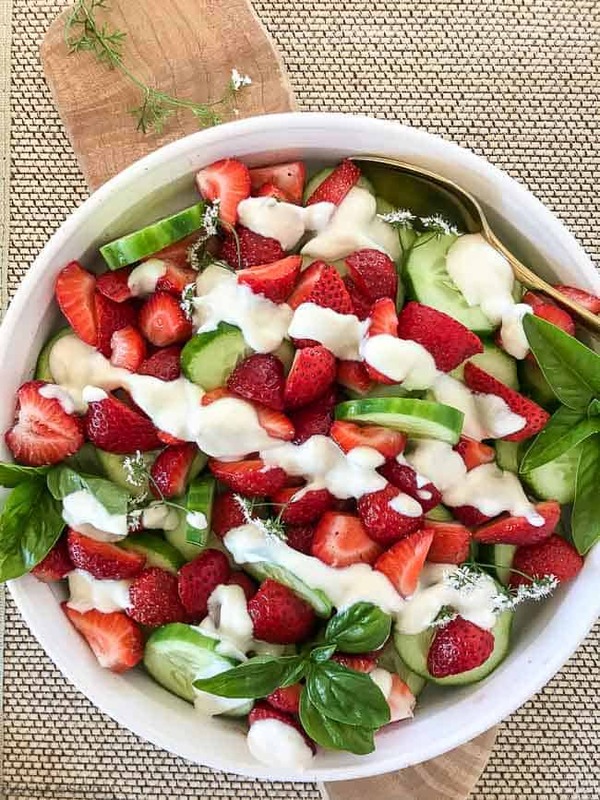 I sliced the cucumbers, quartered the strawberries and tossed them with sweetener and cardamom, combined the ingredients for the dressing, and toasted the almonds. I packed all the components in reusable containers, and assembled the salad just before serving time. 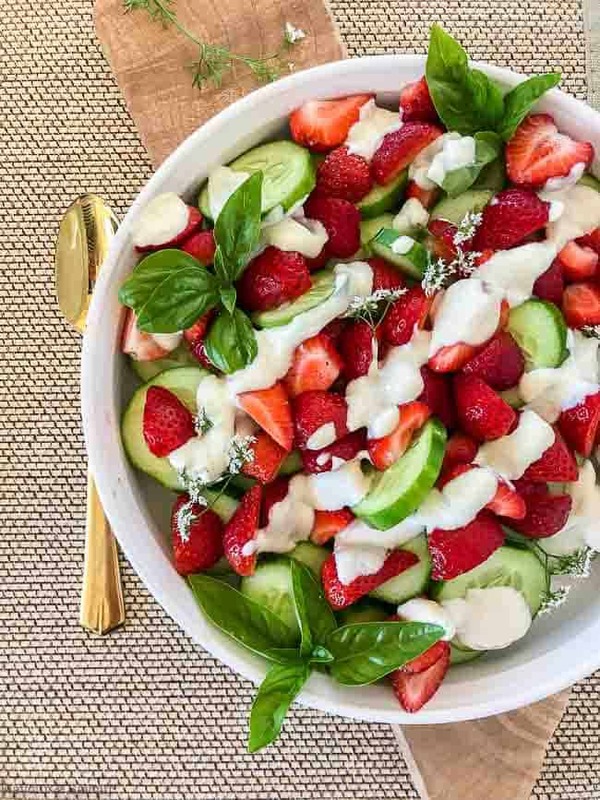 Savour the flavours of summertime with this strawberry salad! 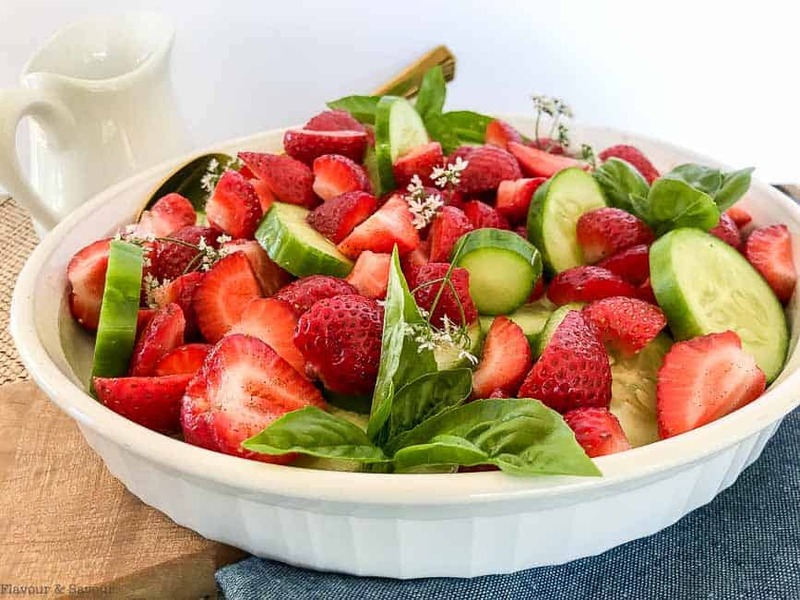 This Strawberry Cucumber Salad is a sweet salad with a surprise! A pinch of cardamom heightens the natural sweetness of strawberries and raises it to gourmet status! Prepare all components of this salad in advance, and assemble just before serving or the cucumbers will become watery. Toss quartered strawberries with maple syrup, cardamom and salt. Toast almonds in a skillet over medium heat with 1/2 tsp oil, just until they begin to brown. Remove from heat, toss with cayenne and salt. Cool. Combine Greek yogurt, maple syrup and lemon zest. Thin with a little cream or milk if too thick. Arrange sliced cucumbers on a serving platter. Sprinkle very lightly with salt. 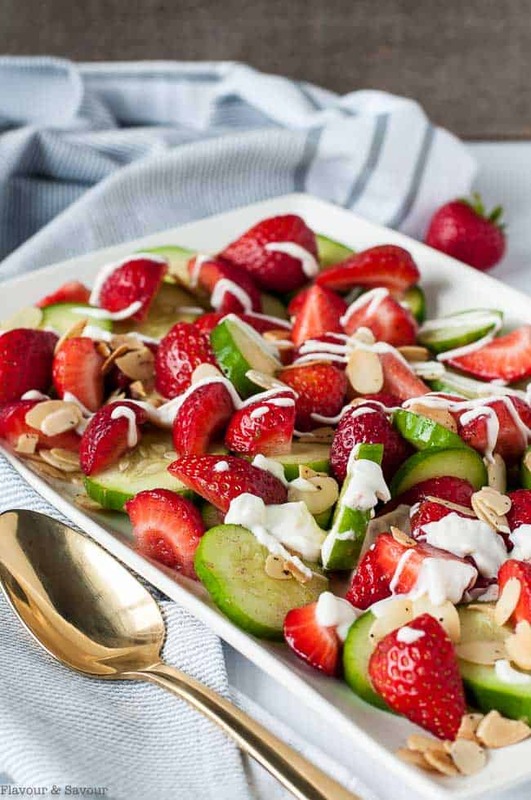 Top with strawberries and toasted almonds and drizzle with Creamy Lemon Dressing. 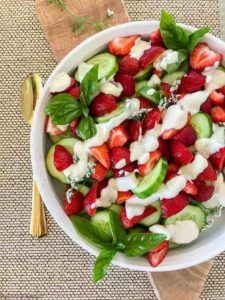 I love strawberries and cucumber together, and all of the other flavours in this refreshing salad sound amazing. Especially the cardamom and cayenne. Sounds perfect, Elaine! Thanks Colleen! I love the little bite from the cayenne, too! I love the look of this salad, Elaine. It just spells ‘summer’ to me. So many wonderful fresh ingredients with beautiful colour and texture. 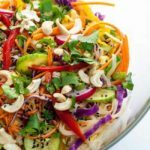 I am so glad that you featured Cardamom in this salad – it has such a nice citrus taste to me and I love it! And the Creamy Lemon Dressing sounds amazing, too. I know one tip that I can share with you regarding English cucumber and that is to scoop out and discard the centre soft seed area and then slice the remainder. No more soggy cucumber! 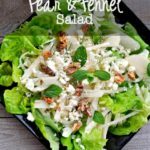 🙂 Thanks for sharing such a lovely salad recipe – I look forward to trying it. Thanks Denise! Hope you love it as much as we do! You always share such fresh salads Elaine! 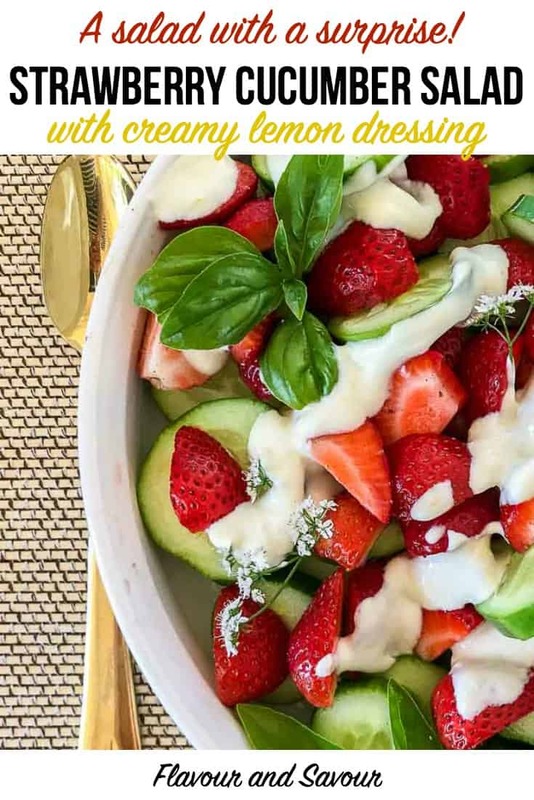 I love a homemade salad dressing and this creamy lemon dressing looks delicious! Great addition of the cardamom in this salad. I bet it adds a nice taste! Yes, the cardamom really brightens up the strawberries! This dressing has become a favourite of ours, too! Cardamom! You don’t say. 🙂 Great tip about going easy at first as not to add too much. What a gorgeous summer dish. I use that same guideline with chili powder, too! lol A little goes a long way! You can always add more, but it’s difficult to take away. Thanks for commenting! Thanks Terri! I’m discovering that there are a lot of people who love cardamom, too! Thanks for commenting. Cardamom is one of my all time favourite spices! I have never used it in a salad like this and I am so intrigued. It sounds like a must try! 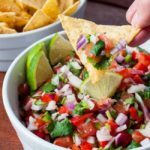 I would have never thought to add cardamom to a salad, but I love using it in my baking. I think it just elevates the flavor of this already pretty awesome salad! Mmm that looks like a perfect summer salad!